November 10, 2010 - The Air Transport Association of America (ATA), the industry trade association for the leading U.S. airlines, commented on the new Transportation Security Administration (TSA) directive, which went into effect Monday, which prohibits transportation of printer and toner cartridges weighing 16 ounces or more on domestic or international flights to or from the United States. ?ATA members are in full compliance with the new TSA security requirements regarding printer and toner cartridges,? said ATA President and CEO James C. May. ?ATA reminds passengers that they must fully comply with the TSA prohibited items list, which now includes printer and toner cartridges weighing 16 ounces or more in both checked and carry-on baggage.? On Monday Department of Homeland Security Secretary Napolitano stated "following the thwarted terrorist plot last week to conceal and ship explosive devices on board aircraft bound for the U.S., the Administration took a number of immediate steps to increase security by tightening existing measures related to cargo bound for the United States?. Some of the steps that have been taken by the Department of Homeland Security included adapting inbound cargo targeting rules to reflect the latest intelligence and ordering a ground halt on all cargo coming from Yemen. In addition, Transportation Security Administration (TSA) Administrator John S. Pistole and a team of TSA inspectors visited Yemen to meet with government security officials and to assist in enhancing Yemen?s security procedures, which are necessary to eventually lift the ground halt on cargo. Late last week, TSA directed industry carriers to begin implementing additional precautionary security measures for international flights inbound to the United States. These measures took effect on Monday. Specifically, the ban on air cargo from Yemen will continue and has been extended to all air cargo from Somalia as well. In addition, no high risk cargo will be allowed on passenger aircraft. Toner and ink cartridges over 16 ounces will be prohibited on passenger aircraft in both carry-on bags and checked bags on domestic and international flights in-bound to the United States. 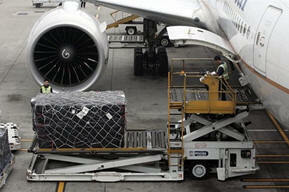 This ban will also apply to certain inbound international air cargo shipments as well. Further, all cargo identified as high risk will go through additional and enhanced screening. These measures also impact inbound international mail packages, which must be screened individually and certified to have come from an established postal shipper. The Administration is also working closely with industry and its international partners to expedite the receipt of cargo manifests for international flights to the United States prior to departure in order to identify and screen items based on risk and current intelligence. Department of Homeland Security is also working with its international and private sector partners on the expansion of layered detections system including technology and other measures.